Elections, legalized pot, climate change, “affordable” housing (or lack thereof), internet hacks, and perennial Vancouver favourite: bike lanes, dominated the headlines in 2018. 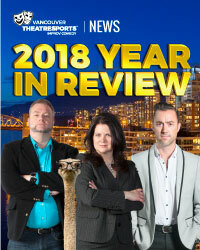 Bid farewell to all this doom and gloom as Vancouver TheatreSports takes an improvised look at these top stories and adds a much-needed comedic perspective as we prepare for the coming year. For show times and ticket information, visit www.vtsl.com.